Many bloggers take the advantage of social media such as Facebook or Twitter to share content and generate traffic. While sharing links manually gives a publisher more control and addition of more information when sharing their posts, auto sharing of new blog posts is definitely a respite for content publishers. Publish blog posts to multiple social media platform If you are an avid blogger, you might have thought about how to share your blog posts to various social media platforms automatically when new posts are created. In this post, I am going to discuss about just how to do that using an online service called - "twitterfeed". 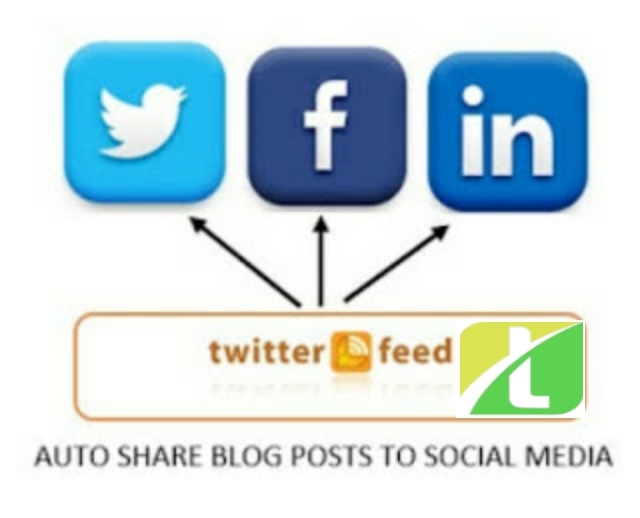 How to setup a service on "twitterfeed" for sharing blog posts to Social Media services? Create an account on "twitterfeed" first. You can sign in with your exisiting accounts such as Google, Yahoo, WordPress, Blogger etc. After signing in, at the Dashboard, click on "Create a new feed". Provide the Name for the feed and add the Blog URL or RSS Feed URL. If everything is okay, you will see a message "Feed parsed OK". Click on "Advanced Settings" to set "Update Frequency", number of posts at a time etc. By default URL Shortening service used is "bit.ly". You may also use "TinyURL". After you are satisfied with the settings, click continue to step 2. Click "Authenticate Twitter button" and accept the authentication - "Authorize App". Your new blog posts will be shared to the Twitter account you set up. 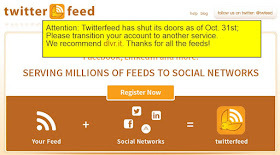 Attention: Twitterfeed has shut its doors as of Oct. 31st; Please transition your account to another service. We recommend dlvr.it. Thanks for all the feeds! Here are the alternative services you can consider instead of TwitterFeed. Some of them are free and some are paid ones. You can explore the best alternative for twitterfeed.com. If you were also using TwitterFeed and now using something else, do let me know which one you are using to auto publish content to Social Media in the comments below. Thanks.